First off - the fine folks at Webs are celebrating their 40th Anniversary. They have a big sale going on so hop on over and see all the beautiful yarns. 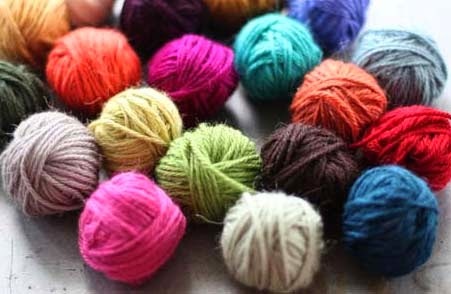 My yarn - COLOR BY KRISTIN - is discounted from $9.95 to $6.99. The sale goes through the end of May. Here's your chance to stock up some of the gorgeous colors. Better yet, order the yarn and start an afghan like Adaliza did. Check out her gorgeous afghan and the tutorial here. It is never too early to think about Fall knitting. I'm excited about this new cookbook/memoir. David writes about the making and writing of it here. Would like to have a look at this book by blogger Ashley English and it is published by my new publisher Roost. Nice post on her blog with lots of beautiful photos, a giveaway chance and a project here. Only a textile artist would see the beauty in this? One of my photos was featured on the Zester Daily website. This photo is for Persian Lamb and Rhubarb Stew and accompanies a very interesting article about rhubarb by cookbook author Laura Kelley. Her cookbook is called The Silk Road Gourmet. Rhubarb season is beginning. You can find my recipe for Persian Lamb and Rhubarb Stew here on our Leyden Glen Lamb website. Going to make a Navarin of Lamb this weekend. What is a Navarin of lamb? It means lamb stew in French. Have you ever made this classic French stew? I'm going to use carrots, small potatoes, turnips and (frozen) peas and of course our lamb. Here is a recipe you can use from Dorie Greenspan. Getting lots of calls for legs of lamb for Easter and Passover. Will you be serving Leg of Lamb which is such a traditional meal for springtime holidays? Just asking. I made Marakesh lamb stew, from the Simply in Season cookbook, for dinner tonight and it was delicious. Wish I lived close enough to buy lamb from you. What my local grocer had was imported from Australia! Would love to use your yarn! I need a new project. Thinking about granny squares.